Ford is spending $1 billion on upgrades to build the next generation of Explorers and police SUVs. Ford announced the ambitious plan at the Chicago Auto Show. Ford is betting big on the future success of its newly redesigned 2020 Ford Explorer. Ford is spending $1 billion to upgrade the Chicago Assembly plant and stamping plant on the city’s south side. Chicago Assembly is Ford’s longest continually operating vehicle assembly plant, having been in operation since 1924. Ford announced the huge investment at the Chicago Auto Show. Ford is also adding 500 workers to build the 2020 Ford Explorer, the all-new Lincoln Aviator and the all-new Police Interceptor Utility vehicle at the plant. The Ford Explorer and the Police Interceptor Utility are incredibly popular and profitable vehicles for Ford. Ford is making the huge investment to make sure that it can keep producing the money-makers while it is scrambling to revamp its line-up. Ford will also produce its Explorer ST and Explorer Hybrid at the plant. Ford claims that it was the No. 1 producer of vehicles in the U.S. and the leading exporter of vehicles from the U.S., in 2018. Ford says it built nearly 2.4 million vehicles in 2018, and employed the most hourly U.S. autoworkers. With the 500 additional employees, Chicago Assembly and the stamping plant should have a total of 5800 workers. Ford will use the $1 billion to build an all-new body shop and paint shop at Chicago Assembly. 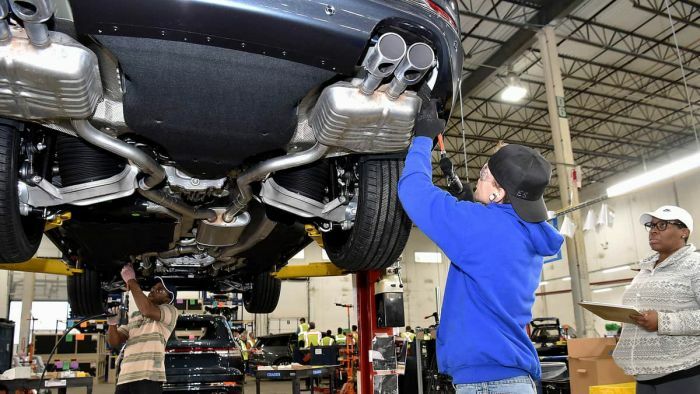 At Chicago Stamping, the company is adding all-new stamping lines in preparation for the 2020 Ford Explorer, Police Interceptor Utility and Lincoln Aviator. Advanced manufacturing technologies at the plants include a collaborative robot with a camera that inspects electrical connections during the manufacturing process. In addition, several 3D printed tools will be installed to help employees build the utility vehicles. Ford is also spending $40 million to improve lighting in and around the plant, improve the cafeteria and break areas, and upgrade parking lot security. The work at the plant should begin in March and be completed by late spring. "Ford's announcement of 500 additional jobs and over $1 billion in plant investments is a testament to the quality and hard work of UAW Ford members,” said Rory Gamble, Vice President of the UAW Ford Department. "Every day UAW Ford members head to work, proud of the products they build and the craftsmanship required in vehicles like the Explorer, Aviator and Police Interceptor. Ford’s investment announcement demonstrates a commitment to the dedication of UAW members in Chicago." The latest generation of the Ford Explorer is expected to build on the Explorer’s popularity. Ford is expanding the SUV’s profile, offering the sportier performance ST model, which will have as much as 400 horsepower and 415 lb.-ft. of torque, with a top speed of 143 mph. Ford will also offer a hybrid version for the buyer looking for fuel efficiency. The all-new Police Interceptor Utility is expected to be a great seller for cities looking to save money on fuel and still have peak police performance. In 2017, The Ford Police Interceptor accounted for more than half of all police vehicle sales in the U.S. The Interceptor outsells all other police vehicles combined. According to Ford, the new Police Interceptor Utility with standard hybrid all-wheel-drive powertrain has a projected EPA-estimated rating of 24 mpg combined, a 41 percent improvement over the current model equipped with a 3.7-liter gas engine. Ford estimates the pursuit-rated hybrid police utility will save between $3,500 and $5,700 per vehicle annually in fuel costs versus the current Police Interceptor Utility. The All-new 2020 Lincoln Aviator will also be built at Chicago Assembly. The Aviator is Lincoln’s new entry in the growing premium midsize utility segment. The debut of the Aviator Grand Touring, marks the first time the company has combined a twin-turbocharged 3.0-liter V6 engine and advanced electrified hybrid technology. The Lincoln Aviator will be available globally, entering the highest volume segment in the U.S., the midsize luxury market, and the third-highest volume segment in China. All three of the all-new vehicles will be available later this year.